How far would you go to stop someone from taking your dog? A 50-year-old man, Mike Heredia, has been reunited with his stolen dog after it was taken during a short walk. 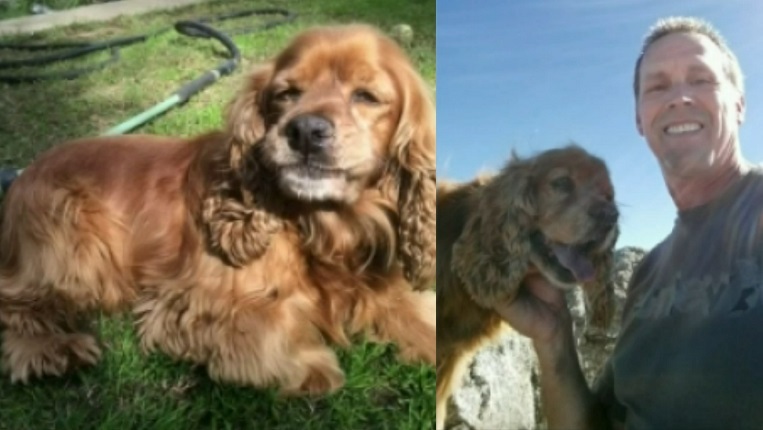 Heredia was walking his Cocker Spaniel, Otis, along with two other family pups to a dog park located just two blocks from his house. A car pulled up next to him and a man got out, talking on his cell phone. Heredia didn’t think much of it until he heard Otis yelp. The man grabbed the dog, who was not on a leash, and threw him in the back of the car. That’s when Heredia jumped through the car window to try to get Otis back. The female driver sped off with Heredia hanging halfway through the window as the male dog thief punched Heredia repeatedly. Heredia, realizing that his life was in danger, called for the driver to stop so he could get out, but the driver screamed and sped up. That’s when Heredia fell out of the car. He was left on the road with a dislocated shoulder, road rash all over his body, and bruises on his face. Heredia was rushed to the hospital for treatment. Heredia worried about Otis, a senior dog with vision and hearing problems. But two days later, police arrived at his home to tell him that Otis had been found. The dog thieves had left him at the dog park. It’s possible they thought he was a younger dog and dumped him when they found out it was unlikely that they could get a good price for him. Otis was fine, just a little bit thirsty. The story could have ended much worse. I encourage all dog owners to keep dogs on-leash at all times until you get to your destination. Even with a well-behaved dog, you can’t predict the behavior of other people or dogs around you, and having your pooch on a non-retractable, 6-foot leash makes any situation easier to control and deters thieves by making your dog a more difficult target. Stay aware. As this story shows, even a short walk close to home can go badly. Would you jump into a thief’s car to save your dog? How far would you go? Let us know in the comments below!